Symbols have been used to tell stories throughout human history. At this point in our collective evolution however, we do not share one set of symbols with universal meaning. Some symbols may have wider appeal, like stars, hearts, birds, faces and moons. While other symbols have become more personal, as we touch in to the deepest parts of our own hearts and discover the unique stories, energies, purpose and meaning within each of us. As we develop relationships with and understand the symbols we are drawn to, we begin to learn our hearts' unique visual language with us. Soon shapes begin to take on new meaning and importance when they show up time and time again in your life, like markers on your spiritual path urging you forward. 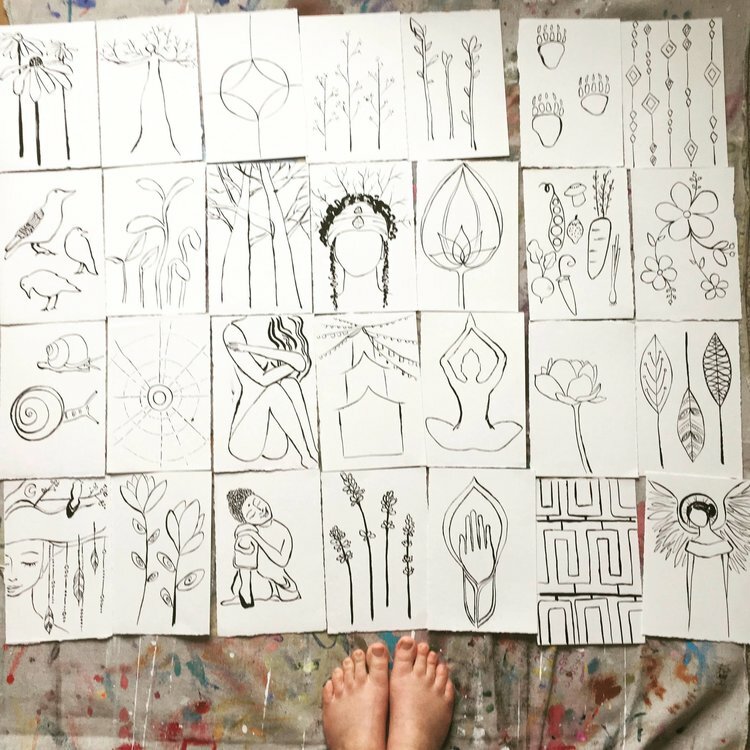 The purpose of this activity is to begin to cultivate your own symbol system... in particular, to begin to reveal the symbols wanting to support and participate in your creative inner journey. In your journal or sketchbook, begin doodling shapes that come to mind. Notice what shapes want to be repeated, played with and developed, allowing yourself to be responsive to your inner impulse without censorship. Don't know how to draw something? Google image it. Contemplate what these symbols or themes mean to you. What stories do they tell you? What do they tell you about yourself? Your process? Your future?